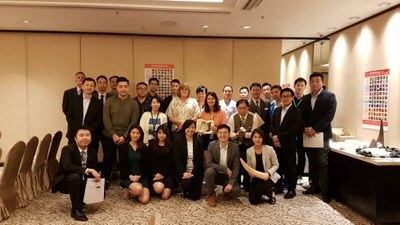 HONG KONG, 29 March 2018— To help detect and report smugglers carrying wildlife and wildlife products through Hong Kong, the USAID Reducing Opportunities for Unlawful Transport of Endangered Species (ROUTES) Partnership worked with Airports Council International (ACI) and Hong Kong International Airport (HKIA) to hold a stakeholder forum and deliver training on the key role that air transport staff can play in preventing the trafficking of wildlife. The half-day event delivered by TRAFFIC, the wildlife trade monitoring network, covered the local and global implications of wildlife trafficking crimes, common wildlife trafficking trade routes, the modes and methods used by traffickers to smuggle wildlife and wildlife products by air transport, and the best way for airport staff to report suspicious activity to the authorities. The workshop provided an opportunity to showcase the good practices for detecting and reporting wildlife trafficking. It also enabled ACI to work with ROUTES, TRAFFIC and HKIA to develop a protocol to further strengthen the existing mechanisms for sharing information between airport staff and enforcement agencies. “Wildlife trafficking occurs in every region of the world and airports have been exploited by traffickers in over 130 countries worldwide. The good news is there are concrete steps that airports can take to strengthen their business operations against the smuggling of wildlife. ACI is proud to work with our members and alongside ROUTES to provide training resources and collaborate on new solutions that help airports and airport staff protect vulnerable species.” said Juliana Scavuzzi, Senior Manager of Environment at ACI World. ROUTES delivered the wildlife trafficking prevention training workshop as part of an airport discussion forum ahead of the 2019 ACI World Annual General Assembly, which is being hosted this year by Hong Kong International Airport on 2-4 April. ROUTES will attend the Conference to share information and resources on how airports around the world can take steps to strengthen their supply chains against exploitation by wildlife traffickers. There will be a dedicated session on wildlife trafficking on 2 April. Many in the transportation sector are recognizing the need to take action against wildlife trafficking. Recently, ROUTES released e-learning modules that are openly available to cabin crew, cargo acceptance staff, check-in staff, and ground handlers to learn the essentials of how to detect and report wildlife trafficking cases. In addition, ROUTES has developed general training materials and conducted trainings across Africa, the Middle East, the Americas, and Asia to train airport and airline employees in key wildlife trafficking hubs. The United States Agency for International Development (USAID) is responsible for the majority of overseas development assistance from the United States Government and leads international development and humanitarian efforts to save lives, reduce poverty, strengthen democratic governance and help people on their journey to self-reliance. For more information please visit usaid.gov or follow @USAID on Facebook and Twitter. Hong Kong International Airport (HKIA) is one of the busiest aviation hubs in the world, connecting to over 220 destinations and serving over 1,100 daily flights by more than 120 airlines. In 2018, HKIA handled 74.7 million passengers and over 427,700 aircraft movements. Cargo tonnage handled reached 5.1 million, the first airport in the world to reach 5 the million mark.